The Make Model Year AJAX Filters (MMY) are ideal for any Automotive sites, allowing customers to find products specific for their vehicle. Give your automotive site (or any site needing sitewide 3-level filtering) the Web 2.0 appeal and enhanced usability. 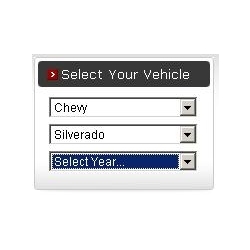 This Make Model Year module (MMY) allows your site's customers to select their car's Make/Model/Year and filters down your site's products specific to the MMY the customer chose (site wide). Price includes standard installation of the MMY add-on, customizations for site as needed by client is extra. Sample sites and demo available upon request. Please contact us or email Compunix here. For our complete automotive part and aftermarket auto package please see www.autopartsshoppingcart.com. Response:Hello Roger, it cannot, however we do offer a complete Automotive/Aftermarket solution built on the excellent AspDotNetStorefront... see more information at www.autopartsshoppingcart.com. There is much more to auto sites and vehicle look ups than just an MMY selector! Response:The MMY's are based on divs and CSS styles that can easily be styled for responsive sites. For example, they can be installed vertically in left menu columns or horizontally across the site. There is no limitation to use or styles as such. Response:Our Make/Model/Year module can be used on any 3 level/selection application or industry, so I believe it will fit your needs quite well. Before I answer the question, I would also recommend checking out our Auto Package at www.autopartsshoppingcart.com which has many other critical features and improvements for such industry and filtering needs. Now, both the MMY and Auto Package have an Excel based importer using a specific template. The template is very similar to the cart's default import template. If you need an XML file importer, we can definitely create one for you or modify the existing Excel one for it. To get a quote for this, please contact us directly. We have multiple automotive sites running this tool and are very happy with the work you guys have done in customizing it to meet our needs. Importing the applications is easy, saving us tons of time getting products into the site.